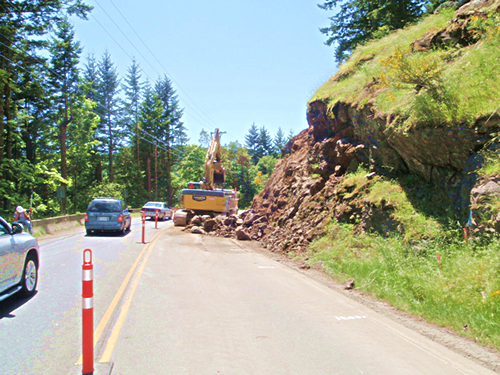 Highway 14 (known locally and colloquially as the Sookahalla), has seen a lot of work lately. The road connects Victoria with Sooke and many communities along the Island’s west coast. These areas have really been growing in popularity, with the inevitable result – more traffic. And by traffic, we don’t mean just vehicles. The number of pedestrians and cyclists using the road is growing, too. To make things safer for them, a major focus of our efforts has been to widen the road’s shoulders. Widening the road also has other benefits, like making oncoming traffic easier to see, and giving us a chance to make better transit pullouts so buses can pull off the road completely to let other traffic by. But road widening is not always an easy task. Many sections have steep hills on one side and sudden drop offs on the other. The only practical way to widen the road is to cut into the hillside and remove tonnes of rock and earth, which can make progress slower and more costly than it would be otherwise. Other projects we’ve been doing along the route went well. Bridges have been replaced, new crosswalks and guardrails have been put in and better signs have been put up. So next time you’re headed out along Highway 14, check out our work and see what you think. And if you haven’t been along that route before, put it on your list as one to drive. The scenery is beautiful, and it’s a great introduction to Vancouver Island’s wild and rugged coast. When was the four-lane portion of Highway 14 completed and why is it so short? We’ve sent your question to the local area manager. Stay tuned. Sorry for the delay in getting this answer to you. The four-lane portion of Highway 14 was constructed approximately 25 years ago and topography, existing property boundaries, and allocated budget were among the reason it’s the length it is. Hope that this helps! What is your criteria needed for MOTI to construct a new four lane highway from Sooke to Langford? I have heard 15K vehicle day usage, continued future growth, funding, political will, and a workable new route recommended by the coming 2017 study release. Is the unfairness in the level of road infrastructure available to Sooke / Port Renfrew residents by comparison to the remainder of the Victoria CRD a factor in the decision making? Thanks for connecting with us here. We shared your comment with the local area manager who let us know that the ministry is currently studying possible short and long term improvements to the highway between Sooke and Langford and we hope to complete our evaluation of those options for funding submissions by summer 2017.
is it possible to get any mapping of where the new section from the end of the four laning to Glenshire road will be?? Hi Sylvia – Not exactly sure what you’re asking. Can you please be a bit more specific? Hi again Sylvia. Are you referring to the new West Shore Parkway connection that Langford is constructing between Highway 14 and Highway 1? If so, information about the alignment of that new road would come from the municipality of Langford. The ministry has partnered with Langford for construction of the intersection on Highway 14 but not the rest of the planning/construction. Hope this helps. Is there a plan to put 4 lanes into Highway 14 – like the 4 lane highway just outside Langford/Colwood? Thanks for connecting with us here. The Ministry of Transportation and Infrastructure has no funded or announced projects on Highway 14 that would include additional 4-lane sections at this time.